Welcome to Hugo! Whether you’re the first person at your organization to sign up or a new hire on a team already using it, these articles will teach you the fastest way to get the most value out of Hugo and how to use the key features. This article won’t explain everything (that’s what the entire help center is for) but we will cover the fundamentals to help you start using Hugo the best way, right away. Hugo is first and foremost a product for taking meeting notes. Your calendar is a big part of how Hugo is architected so that notes can be linked to your meetings. This removes the challenge of staying organized, and makes it easy to find your notes in the future. When you log in in to Hugo using your Google or Office 365 credentials, you will see the Inbox. Think of this tab as your home base. 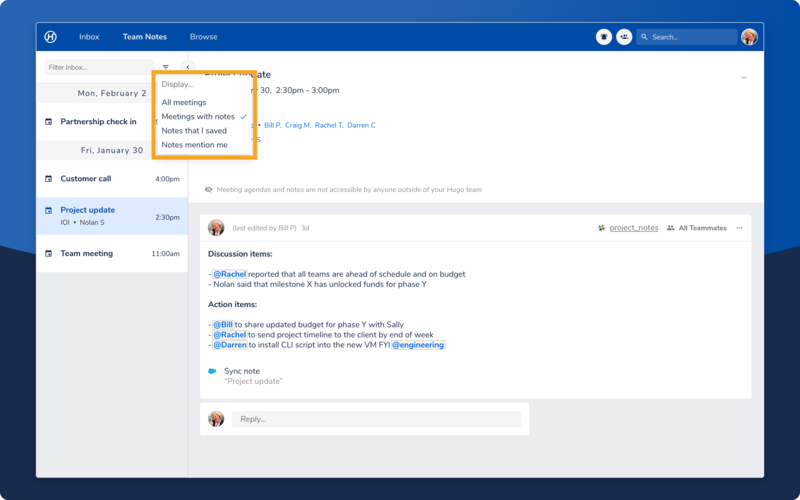 Meetings: On the left-hand side, past and upcoming meetings are automatically loaded from your calendar, and used as the storage structure for your notes. This means that you are giving Hugo access to sync meetings from your work calendar. Meetings in your Inbox are not accessible to other teammates unless they are also attending that meeting. The filter at the top allows you to search for a specific meeting that you're interested in saving an Agenda or Note for. 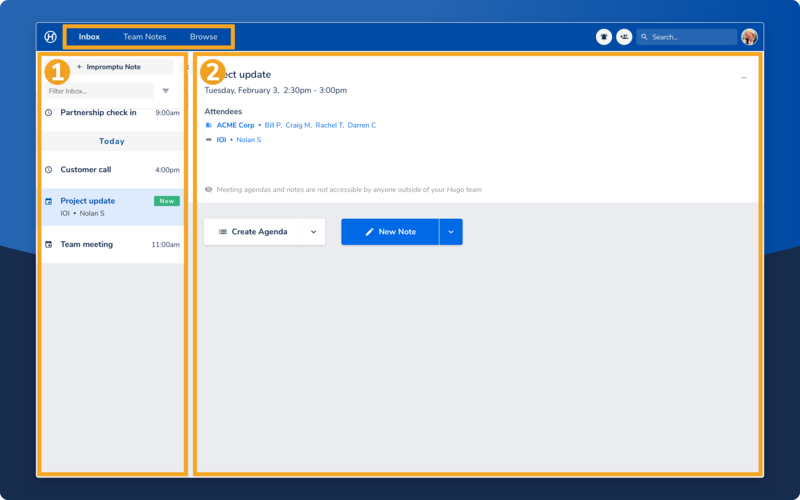 Meeting Details: When you select a meeting, extra details are displayed on the right-hand side. Hugo identifies the attendees and organizes them according to their companies. As your team saves notes in Hugo over time, click on a contact or company to surface past notes and prepare for a meeting. This is also the screen where you create a new Agenda or a Note for the selected meeting. When you save a note for a meeting, it moves out of your Inbox and into Team Notes. This tab contains all the notes that you have access to, which have been saved by you and your teammates. This screen is similar to the Inbox screen. On the left-hand side, you will find meetings which contain notes. On the right-hand side, the details of the meeting and the saved notes are displayed. You can also filter your meetings as required. 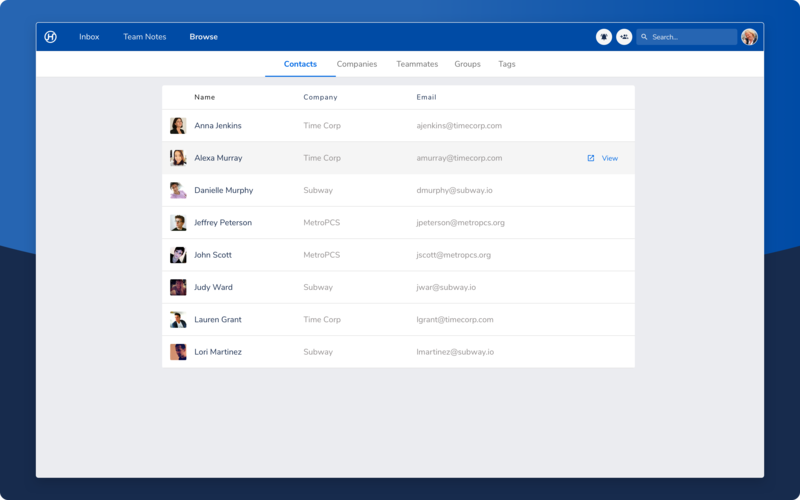 This tab allows you to browse a list of Contacts, Companies, Groups, Teammates, and Tags. Contacts and Companies: When you attend a meeting, Hugo categorizes information about the attendees into Contacts and Companies. Select a Contact, or Company to view all meeting notes associated with that entity. Teammates and Groups: As your Hugo team grows, admins can organize create Groups to make note sharing and @mentions more powerful. Select a Teammate, or Group to view all meeting notes associated with that entity. Tags: As you save notes, you can add tags to organize them more easily and make them searchable in the future. Select a Tag to view all meeting notes associated with that entity. Creating Agendas and Notes are the most fundamental building blocks of Hugo. In the next article, you will learn how these steps will help your team stay on the same page.